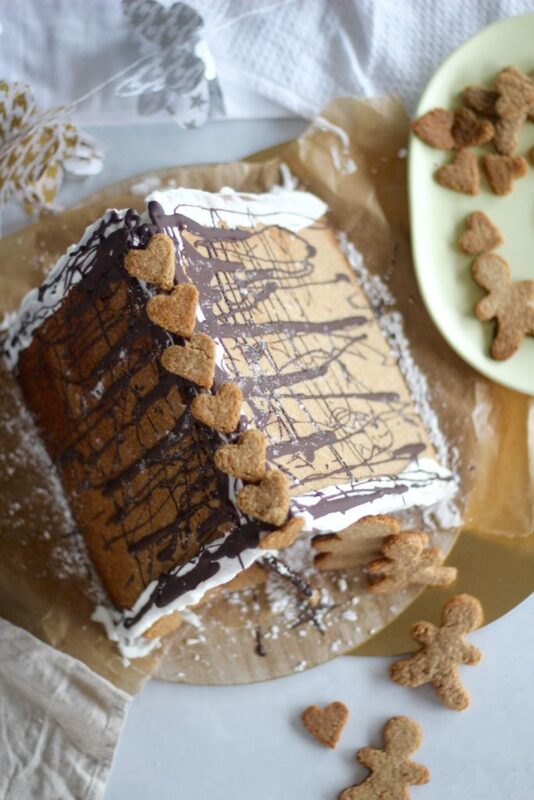 Refined sugar free gingerbread house & healthy royal icing! Perfect for Christmas Day! 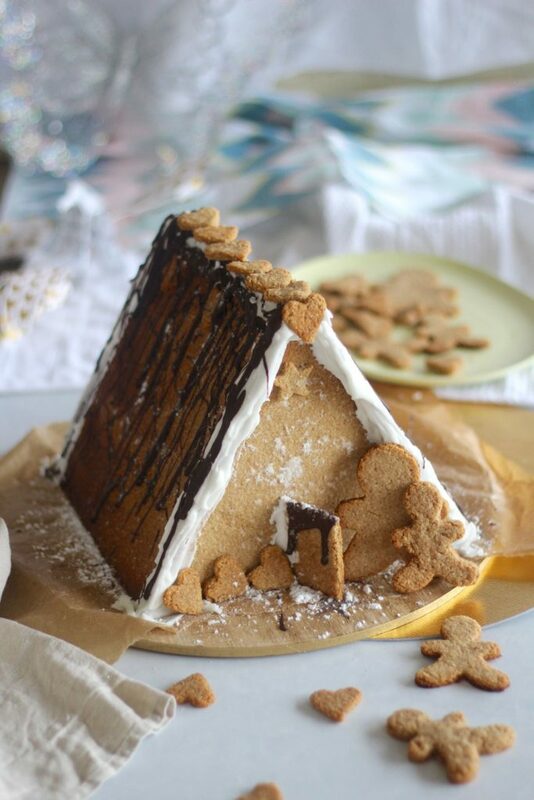 Refined sugar free gingerbread house WITH healthy royal icing! This blog post is brought to you by our amazing blog partner Naturally Sweet. We’re so excited about this collaboration and can’t wait to share how we’re using their amazing products with you! Seriously, we did it. We made a gluten free, refined sugar free gingerbread house but the most amazing thing is that we made healthy royal icing. YES, the icing that sticks the house together. And it’s ridiculously easy. :O (c’mon, do the face) right? We impressed ourselves with this creation too! Probably because last time Emma tried to make a gingerbread house and stick it together with icing, we ended up using a hot glue gun. True story. ANYWAY! We KNOW you’ve been waiting all year to get your gingerbread bake on and now there’s absolutely no excuse to not try making your very own healthy gingerbread house. Seriously, the ingredients we use pretty much make this a breakfast option (i.e. it’s that good for you :P). Over the past 6 months we’ve been having fun with new sweeteners thanks to our friends Naturally Sweet (as soon as you see their website you’ll understand even more why we love them…). The new sweeteners on the block we love: xylitol, erythritol and stevia. Why? Well, we LOVE making our treats low carb, high fat, because when your treats are low carb high fat, you really can’t eat the whole damn thing in one go. You actually feel satisfied from your treat, rather than feeling OH MY GOD I WANT TO EAT ANOTHER PIECE AND ANOTHER AND ANOTHER until, oops, there’s no more treat left for tomorrow. Yeah, we’ve been there. So we’ve found that by switching our sweet treats to a more low carb high fat scenario, that we eat less of the sweet treat. And we all know, even though they’re healthy sweet treats, we still gotta play the moderation game. We can’t just eat sweet treats every damn minute. Like you can, but you wouldn’t feel good. And a Merry life is about feeling good. For the gingerbread recipe, we used erythritol for the sweetener. There’s no bitter after taste and the Naturally Sweet brand is made from 100% natural non-GMO erythritol (a sugar alcohol). It’s about 70% as sweet as regular sugar but if you’re like us and have been refined sugar-free for a while you really don’t need much! You’ll see we only used 1/4 cup in the entire batch of gingerbread! Oh yeah! Some more fun facts: it has a zero GI level and doesn’t raise your glucose or insulin levels which makes it super awesome for diabetics. It’s also non-laxative (yay, because some sweetener make you poop yucky when you over eat them… eww) AND it’s good for your teeth! The icing was the thing we were most nervous about! 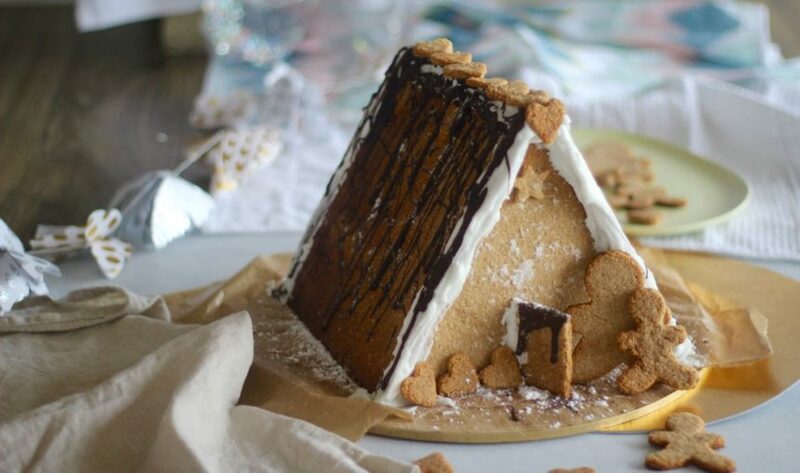 Especially due to our only other gingerbread house experience resulting in a hot glue gun rather than icing… anyway, we decided that if the icing didn’t work, we’d just break the walls and roof into pieces and eat it as Christmas day cereal (yeah, we weird). OK! The icing! OMG it DID work and it was sticky so it actually cemented the walls and roof together. It’s a healthy royal icing. Your regular royal icing has egg white, icing sugar and vanilla or lemon. SO we gave it whirl MINUS the regular icing sugar. Instead, we used Naturally Sweet Xylitol Icing Sugar. Here are the fun facts: Naturally Sweet Xylitol is made from corn. Again it’s non-GMO and 100% natural. Has a low GI of 7, no bitter aftertaste, prevents and actually fights cavities AND it freshens breath. Once again, perfect for diabetics and us healthy eaters who still want to enjoy our sweet treats minus the sugar! What are we all waiting for?! It’s time to make healthy gingerbread houses and go to magical Merry Christmas land. We used 2 x 20cm squares (for the roof) with 2 x 20 cm equilateral triangles (for the front and back of the house). We say the less joins the easier, that’s why we went for a cute little triangle house design. Cut out these shapes in a thick, shiny cardboard (so the dough doesn’t stick to it!). The house can be made any size as long as the length of the equilateral triangle is the same length as the side of the squares, neat, huh? We also cut a little door (the size doesn’t really matter, you could have a giant door if you really wanted to!). Once you have the gingerbread pieces and icing made (see recipe below), putting it all together is the fun part! Hold up the front and back of the house using cans of tomatoes (or any food :P). Then spread icing on the edges on one of the roof sides. Place that on one side of the walls and hold it up with another can of tomatoes. Then, do this with the other side. Fill the gaps and add extra icing on the outside of the joins, including the top. We used our fingers because that was easier (don’t worry, we washed our hands!). Don’t forget to stick your door on with icing as well as any extra gingerbread decorations (like we did with the mini hearts on top of the roof!). Place into the fridge so the icing sets well. If you live in the heat, it will need to stay in the fridge, otherwise the icing will go soft and the house won’t be as strong! You can use whatever you like but we used melted healthy chocolate and drizzled it all over the house (looks and tastes epic). Plus we sifted extra xylitol icing sugar because it looks like snow! You should also make gingerbread people so it looks like there’s a cute little family that lives in the house. We kept ours pretty simple but you could use fruit or even make some paleo jelly lollies to decorate your house! Go to town on your healthy gingerbread house, seriously, you’re gonna impress everyone when you pull this out of the fridge on Christmas Day! The funnest part is, of course, EATING the gingerbread house. NOM NOM NOM! Oh and if you don’t want to make the house just make a batch of the cookies and decorate them with a heap of the healthy royal icing and drizzle them in chocolate. OMG, that will be epic and so yum. Trust us. You must make these. When you do, we wanna see those Merry creations! Share your photos on Instagram and Facebook and tag #GetMerry so we can share our faves! If you’re looking for epic, tasty sweeteners to make your healthy gingerbread and icing, check out our friends Naturally Sweet! Don't forget to stick your door on with icing! Store in the fridge, especially if you live in a hot place as the icing will soften if it heats!